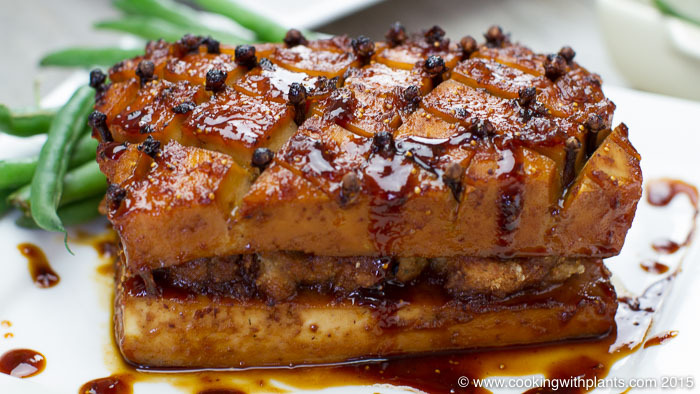 This Maple Glazed Tofu with “no cook” Apricot Stuffing tastes as good as it looks! Crispy caramelized goodness on the outside with soft marinated tofu on the inside. This is one dish that will get the family salivating! 2 tbsp Fig Paste Fig, Apricot or Orange Jam would also work fine. 1 kg Tofu (firm/extra firm) (DO NOT USE SILKEN TOFU)! 2 slices Bread, toasted or stale chopped into thumb sized pieces. For this section you will need a mixing bowl or pouring jug. Simply mix all the ingredients together with a spoon until you have a smooth consistency. To prepare the Tofu you will need a sharp carving knife (serrated blades help), a chopping board, tea towel and a large baking dish. Firstly, remove the tofu from its packaging and rinse under cold water before patting dry on your tea towel. Then slice the blocks in half length ways (see video at top of this page for full demonstration) so you have 4 halves. Now is a good time to set your oven to 200°C/400° F.
Set aside the 2 top halves and then use a fork to thoroughly prick the bottom half of the tofu on both sides so that the glaze can easily seep into the tofu. Now take the 2 top halves of the Tofu and slice a criss-cross pattern about half way through the block (see video for demonstration). Next take your whole cloves and insert them into the intersection of each criss-cross cut on the top slices of Tofu (see video). Now place all 4 tofu blocks into your baking dish in a single layer. Pour approximately three-quarters of the glaze over the tofu blocks before setting aside to marinate. If you have time, let the blocks sit overnight in the fridge. If not, anything over 20 minutes will allow some flavor to go through the tofu. Grab yourself a medium to large mixing bowl and mixing spoon. Put all the dry ingredients into the bowl, then add half the broth before mixing thoroughly. Now add the other half of the broth and mix again. Set aside. Once the tofu has had time to marinate use a spoon to re-baste the tofu before placing it in the oven for 20 minutes. After 20 minutes take the tofu out of the oven. Divide the stuffing in half and work it to fit nicely over the bottom tofu halves, then place the top tofu halves onto the stuffing - see video for demonstration. Pour the remaining glaze over the tofu before placing in the oven for a further 10-15 minutes. Once the tofu has a beautiful caramelized look it's time to remove from the oven and serve with your favorite holiday sides. I made this for Christmas and my husband and I really enjoyed it. Will definitely make it again. Also, made the Christmas Bread Pudding for dessert. Had to substitute 3/4 cup of cashew with blanched almonds (1/4 cup cashew and 3/4 cup almond) which I had on hand. Also, used low-fat soymilk (also what I had on hand) instead of coconut milk/cream and it was still really good. Also made it for our camping Xmas lunch and it was amazing! The day before we left I made up the marinade into a screw top jar, then placed all the stuffing ingredients (except the water) into a zip lock bag. Four days later I prepped the tofu, poured over the marinade and left it to soak, added the water to finalize the stuffing ready for the finale. My son was and grandson gave it a huge thumbs up. Do you have total calories, calories from fat and sodium info on the recipes in the cookbook and website? I don’t sorry. I stopped counting when I went vegan… and have for the first time in my life managed to lose weight and keep it off for years.